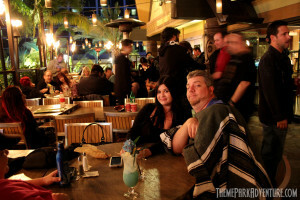 On Sunday, April 21st, Theme Park Adventure’s Spring Nights at Sam’s II took place under the burning Tiki Torches of Trader Sam’s at the Disneyland Hotel! It was an evening of fun, drinks and socializing! More than 50 people showed up at the event, some of them first-timers, which was awesome to see! As fate would have it, that morning, the very first videos of Hong Kong Disneyland’s newest attraction, Mystic Manor, hit the web. Many of the attraction’s stunning audio animatronic figures and gorgeous set pieces came from the talented team at Garner Holt Productions right here in Southern California. What a great opportunity everyone had to give Garner and his team a round of applause for their contributions to this world-class attraction in person! TPAers lined up to meet Garner Holt and congratulate him and ask questions about the business of theme park design; specifically creating the best animatronics in the world! 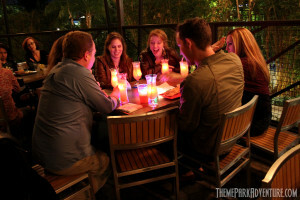 It was a very cool “bonus” for Disney fans attending this month’s TPA meet! On Thursday, April 18th, Theme Park Adventure attended a media hard hat tour at Knott’s Berry Farm that took us through the brand new Boardwalk section of the theme park, which is under heavy construction and refurbishment. As Cedar Fair and Knott’s (both under relatively new management) move forward with a multi-million dollar plan to re-imagine California’s oldest theme park, there is much excitement in the air among not just fans, but employees of the park as well. Anxious to show off what’s happening, Knott’s gathered members of the media in the Wilderness Dance Hall and began the morning with a slideshow presentation. 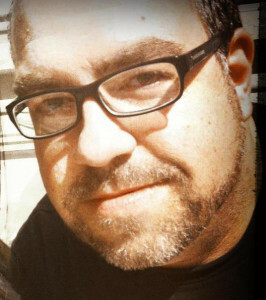 I have written about the themed entertainment industry, attractions of all kinds, and the men and women behind them for more than 20 years. I have seen a lot in the past two decades, from the opening of Luxor in Las Vegas with its groundbreaking Doug Trumbull attraction trilogy to the modernization of the San Diego Zoo with high tech habitats such as Hippo Beach and Polar Bear Plunge. I’ve watched Six Flags Magic Mountain build and open some of the biggest scream machines on Earth, and have been around to cover both the original opening day and re-dedication of Disney California Adventure. Throughout my travels, I have been fortunate enough to interview some incredibly influential individuals for Theme Park Adventure, from Marion Knott to Marty Sklar. Always awed by their accomplishments and life stories, the history of the theme park industry has always been near and dear to my heart; often times, more exciting and engaging than the present. Not because the now isn’t exciting – it is, and it is my own profession – but hearing about how the pioneers did things from scratch with a vision and elbow grease… those stories and events capture my heart, and truly shaped the industry we all love and cherish today.